Huskies were bred to RUN, and to PULL. Thousands of years of breeding went into creating these dogs, running is in their nature. Today’s urban environment, however, doesn’t provide enough exercise for this breed's needs. A daily walk around the block, trip to the dog park or obedience class simply won’t cut it, especially for a young dog. A Husky who isn’t getting his or her exercise needs met can result in destructive behavior, escaping, in-house “zoomies” and too many good dogs ending up in shelters. “Mushing” is defined as “a sport or transport method powered by dogs.” Dryland Mushing began with snow mushers, who use it for training and to keep sled dogs in shape during the off season. 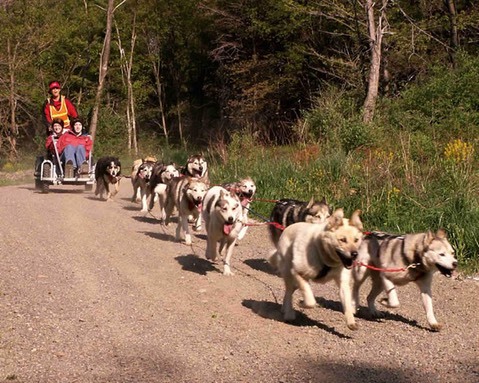 It’s similar to traditional dog sledding, except it’s done on dry land, and involves a team of dogs pulling a heavy 3-wheeled cart or motorized ATV. Urban mushing can be especially helpful for dogs who had a bad start in life. Dogs lacking in self-confidence, not properly socialized, or with aggression problems have benefited greatly from learning to work in tandem with their human or as part of a dog team. A healthy dog can pull up to 2½ to 3 time their own weight, human and equipment combined. Dogs should pull no serious weight until 18 months of age, so that their growth plates can settle, and the dog should not have any physical problems such as dysplasia. Training can be taught at any age, starting with commands and pulling light weights like bicycle tires or a gallon jug with pebbles in it, so that they become accustomed to something behind them. It does take SOME training, unless you opt for a side attachment; since there are no reins, the dogs must learn the verbal commands so you can tell them where to go. The rest is just practice, although there are individual trainers and workshops/seminars/fun runs held by different groups. Where you mush is only limited to the ability of the handler and dog(s). Pavement, sidewalks, dirt trails, parks, fields, and the woods are all suitable locations. As the skill set of the handler and dog improve, they can take on more challenging terrain. At the same time, it’s vital to build up slowly so the dog has time to adjust to the increased exercise. Please keep in mind that this sport is not for everyone. It’s one of the best things you will ever do for you and your dog, but it is a bumps-and-bruises sport and at some point, you WILL take a spill. Always wear a helmet, and make the safety of yourself and your dog(s) your first priority! Carry water and give your dog rest breaks, and never run dogs when it’s hot. Many also regularly use gloves, and/or some add knee/elbow pads. A good set of brakes (preferably disc) is key to staying safe and out of harm’s way. 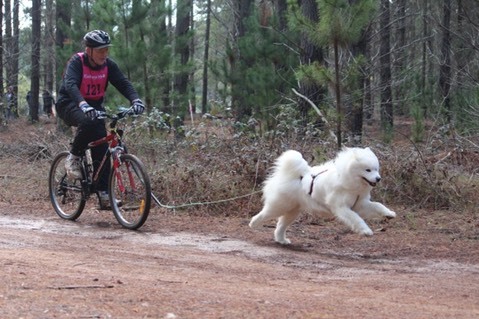 Projecting confidence in what you’re riding gives your dog confidence in your lead and makes training all the more fun, instead of a frightening experience for you or your dog. Bikes and scooters are the easiest and cheapest with one to three dogs (mountain bikes are recommended for trail riding); if you have difficulty with standing, walking or balance, a Chalo Dog Sulky or Sacco Dog Cart let the dogs do all the work. You should be familiar and competent with your chosen set of wheels before attaching your dogs to them. Beginners should choose something that’s easy to balance, navigate, and provides maximum control over their dogs. There's not a lot of equipment involved, any bike will do, and while not all scooters are viable for urban mushing, Gravity makes an excellent one. So does Pawtrek, which is based in Canada, and there's also Pawtrekker, which is available from UK distributors. Unfortunately the best scooters for urban mushing are made outside the U.S., but nowadays, shipping is no problem, and shipping TO the U.S. is often cheaper than shipping WITHIN the U.S. There are also numerous other manufacturers. Diggler, the best urban-mushing scooter made in America, went out of business, but used ones still come up all the time. The most important thing is to make sure the harness ensures proper pull distribution; a regular walking harness will NOT do. The traditional “X-back” harness used by snow mushers is fine for scootering, but not great for bikes, because the point of attachment is so low on the back. Also, the x-back only stays on well when the dog is actively leaning into it; it’s very easy to back out of. or the "Saddle Back Harness" from Dogbooties. The tugline (or "scooter line") and attachment are what connect the dog(s) to the bike or scooter. If you only have one dog, you only need one line & attachment. For two dogs, a double scooter line or a “Y-line” attaches the tow line to two separate harnesses. 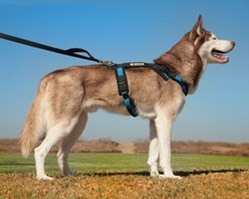 The double scooter line from Alpine Outfitters comes with a “neck line” which attaches to both dogs’ collars to help keep them together. Most people use a bike or scooter “Noodle”, to keep the line from becoming entangled in the front wheel. Use our link to buy them on Amazon. Just thread your tow line through the middle, add a strap, and they work just as well. There is also the "Bay-o-Net", a rigid version of the scooter noodle. The most recent innovation is a bike or scooter with a side attachment, where the dog runs alongside the bike or scooter, rather than pulling. More like "exercising your dog" that actual urban mushing, it's increasingly popular because it requires less training for the dog. The Springer is most popular for bikes, and the Bike Tow Leash gets high reviews. The K-9 Kennel Store makes scooters specifically with a side attachment, and Pawtrekker makes an attachment for its scooters with front and rear disc brakes. The links/products shown are for example. Everything you need to know can be found online by Googling "urban mushing", "urban mushing equipment", "urban mushing scooter", etc. Prices and quality can vary widely; please ALWAYS do your homework carefully. If you can, find a good website or Facebook page of urban mushers and ask those who actually use the products. Many thanks to Niki Beecher for this article and research. Shopping via http://smile.amazon.com/ch/45-2274989 creates a donation to our rescue.